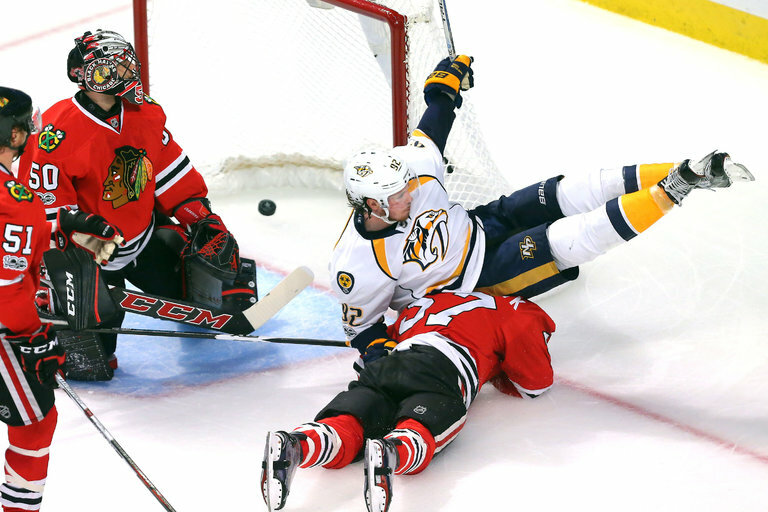 The Predators’ Ryan Johansen (92) scoring past Blackhawks goalie Corey Crawford (50). The Predators lead the series, 3-0. The first week of the N.H.L. postseason has been as unpredictable as anyone could imagine, even in a sport where upsets are the norm, home-ice advantage is often meaningless and a hot goaltender can overshadow everything else. The Chicago Blackhawks, a perennial Stanley Cup favorite, are down by three games to none to the Nashville Predators, and the N.H.L.-leading Washington Capitals trail the Toronto Maple Leafs by two games to one in their first-round series. But those are only parts of the story. Seven of the first 24 games featured a blown lead of two goals or more, 11 went to overtime, and winning goals came from the unlikeliest of sources.